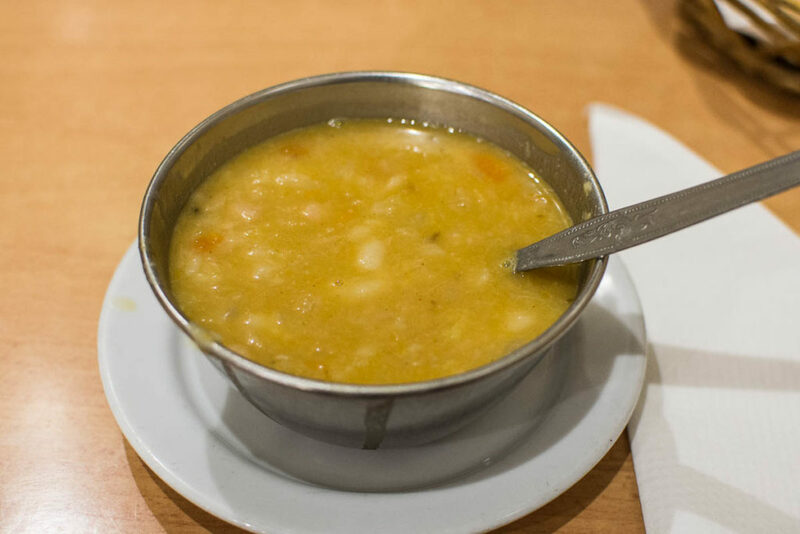 Last week I visited Lisbon and wanted to discover some good places where the locals eat. When I travel, I often fancy authentic places and I avoid restaurants tailored for tourists. 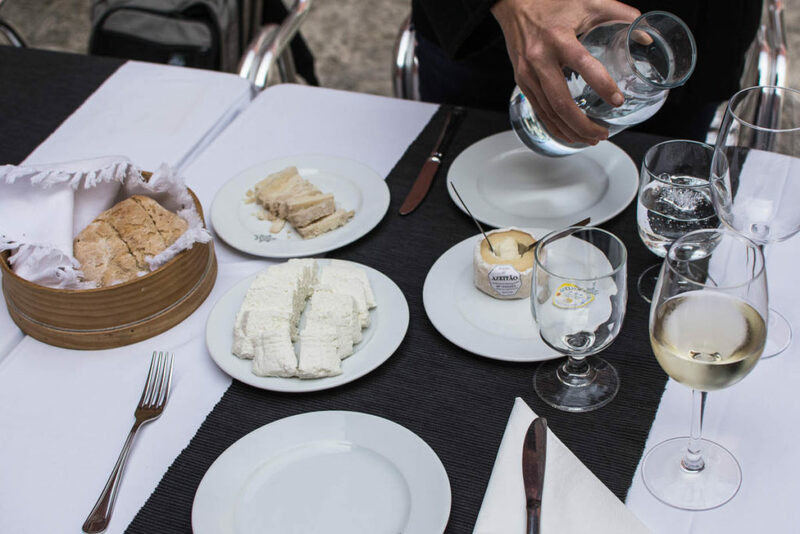 This is why I contacted Secret Food Tour Lisbon and simply booked a food tour in Lisbon with them. And I did well, my guide took me to places I would have never discovered wandering in the city on my own. As the tour can be adapted to various dietary restrictions and food allergies except for the vegan diet (since the Portuguese cuisine is based on fish, meat, vegetables, eggs, and cheese), I challenged them :-). I asked for a tour adapted for a vegetarian who eats some sort of fish (no raw fish and no seafood) for my last free day in Lisbon and received a quick answer offering me a tour which suited both dietary restrictions as well as my tight schedule. Many thanks belong to Carmen who was a great guide! As a local living in Lisbon since many years and loving food, she knows THE places and she also knows a lot about the Portuguese food. We met in front of the Arch at Praça de Comercio, one of the main meeting points in the center of Lisbon. After she re-verified my dietary restrictions, we started our food tour through Baixa and Mouraria. Normally you shall be served an amazing pork sandwich in the first place to eat, but as Carmen adapted the tour for me, replacing meat with fish, cheese or vegetables, we first stopped in a shop where the Portuguese people buy sardines and other canned fish in Baixa. 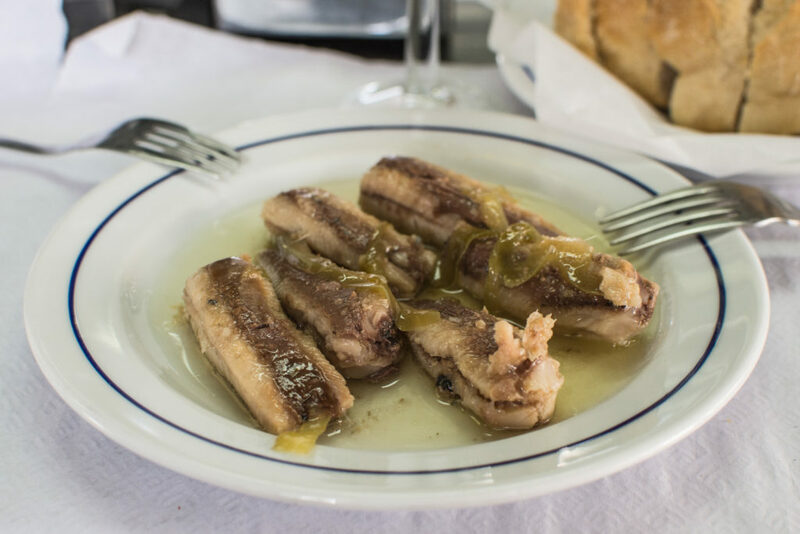 This is something for foodies to bring home from Portugal! 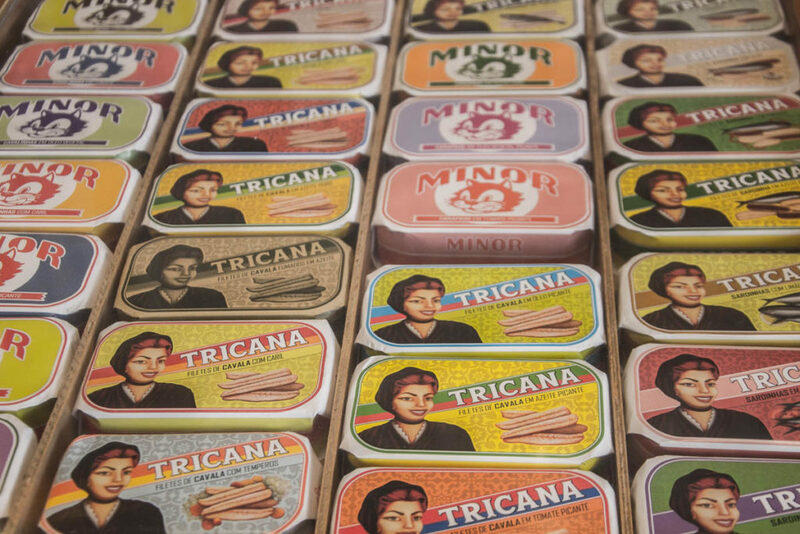 Although there are many shops offering the fish tins in fancy packs in the city, usually they are more expensive and it might not be a good quality. The shop where Carmen brought me exists since many years and we were well served by a nice man with good English and French and a smile. And there was so much to choose from. Carmen got me delicious sardines which we ate in our next stop. Then we headed to a large “Garrafeira” where I could taste good Porto wine. She told me that this is a good place to buy some bottles of Portuguese wine. Although not everything is exposed, they really have a large selection of bottles, from all regions and price ranges. I even saw some bottles from the 19th century, how amazing! And finally, we arrived in a small family bistro where I could taste the sardines with bread and a glass of “Imperial” beer. Normally the meat lovers should enjoy some good “Bifana” (a delicious pork sandwich) here. I will not tell you more about the pork, but my sardines were delicious! The next stop was at a small bar where I first tasted a ginjinha. 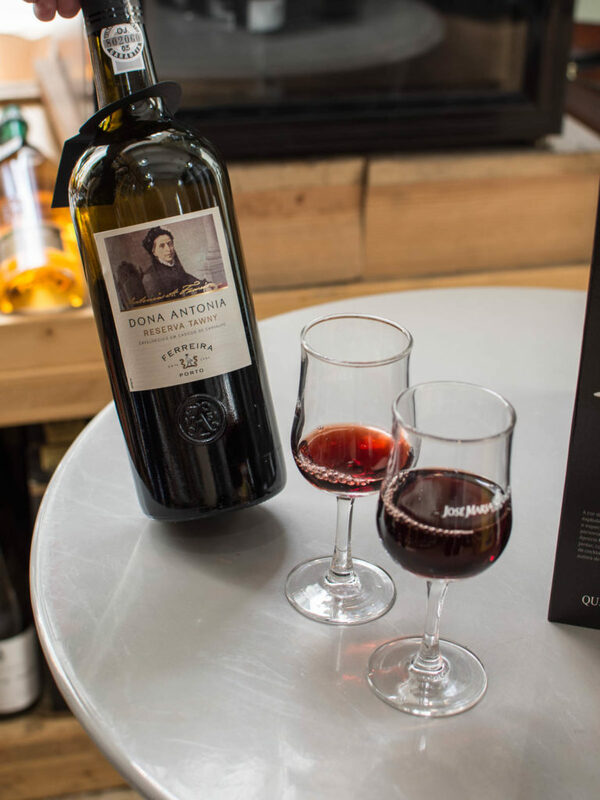 This is a Portuguese sour cherry liqueur that you will find throughout the whole city, although not everywhere they serve a good one! Carmen told me that a good Ginjinha can be recognized if you taste sugar on the first sip and not alcohol. I indeed tasted first the sweet flavor and almost no alcohol. Ginjinha is not being drunk as a shot, but rather tasted with each sip. And it is really good! 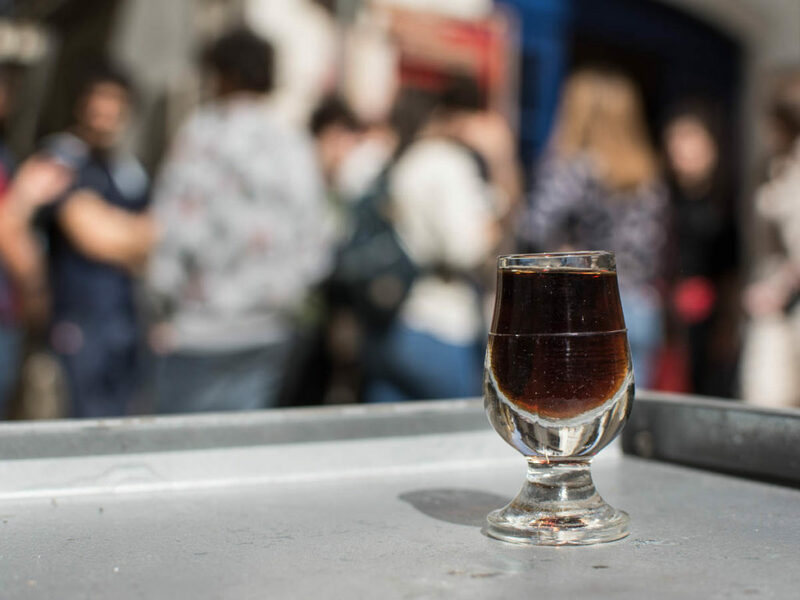 As seen in many bars in Lisbon, they have tiny tables in front of the bar and so people can drink it outside. 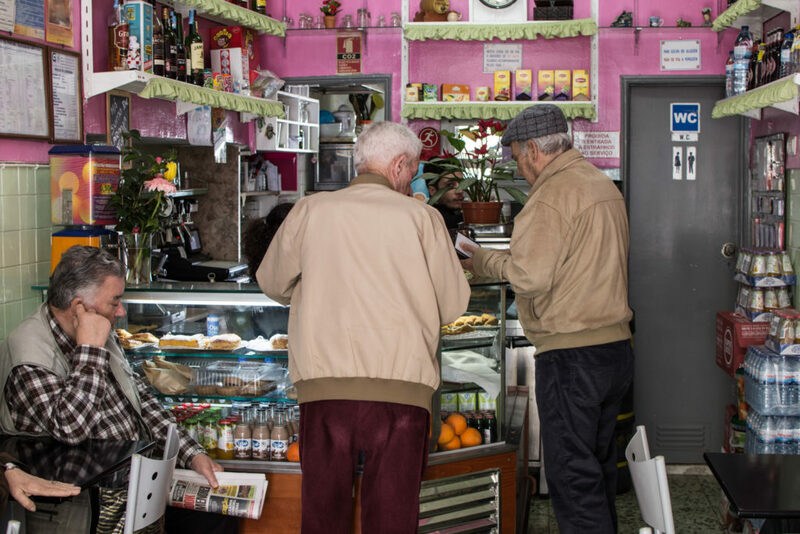 Back to Baixa, we passed by a family shop, where Carmen showed me how bacalhau, the famous fish that the Portuguese are the largest consumers worldwide, is being conserved. One can choose between large pieces of this fish conserved in a salty crust lying on a shell as well as smaller pieces in a freezer. The salt ones were pretty firm on touch and apparently, it takes time to de-salted them before they can be prepared as a meal. In the other part of this shop, they had ham and cheese. 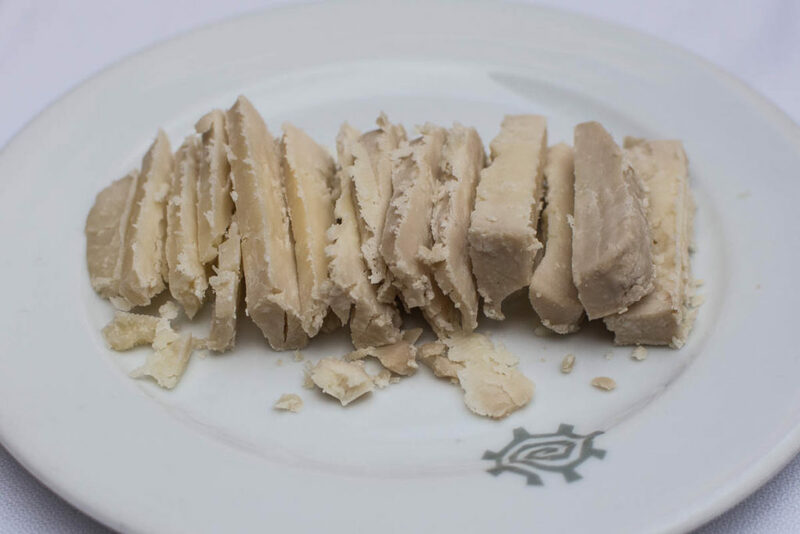 Carmen selected three types of cheese in different stages of maturation: fresh goat cheese, semi-mature sheep cheese, and mature mixed cheese. As there was no more the fresh goat cheese, we got fresh sheep cheese and we took them to another place, a secret restaurant. I was passing this place every day, I would have never imagined a restaurant inside! We entered this nice palace, took stairs to enter an interior of the secret restaurant, where we were welcomed by a nice chef and continued to the patio where our table was prepared in the shadow. They brought us both white and red wine as well as tap water. Carmen prepared the cheese she bought before in the shop for us and brought it on the table. “This is how Portuguese people eat”, she said. “We like to sit down, talk, drink wine and nibble pieces of bread with cheese while waiting for the main course”. Here the main course should normally have been petíscos. As I don’t eat octopus, Carmen asked the cook to replace it with peixinhos da horta (deep fried green beans and the translation literally means little fish from the garden), which is 100% vegetarian and delicious! The other part here was pastéis de bacalhau (salt codfish cakes) that I love. 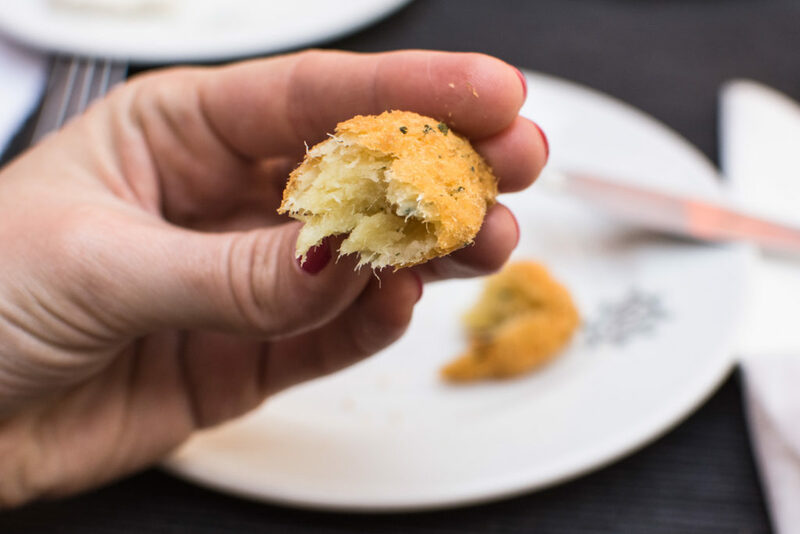 These are small croquettes made of potatoes, dry salt, codfish, onion, and parsley. 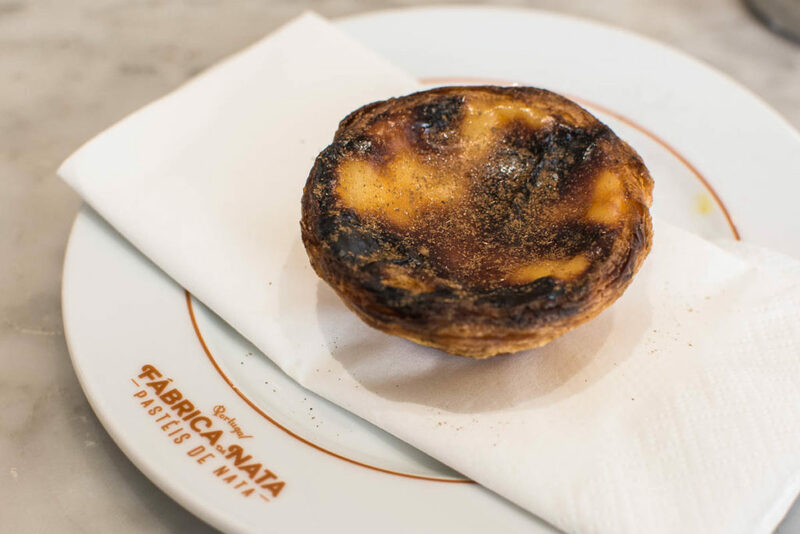 Carmen also explained to me how to recognize the good pastéis de bacalhau: a lot of tiny hair should be visible inside, which means that there is enough fish and not just much potatoes. 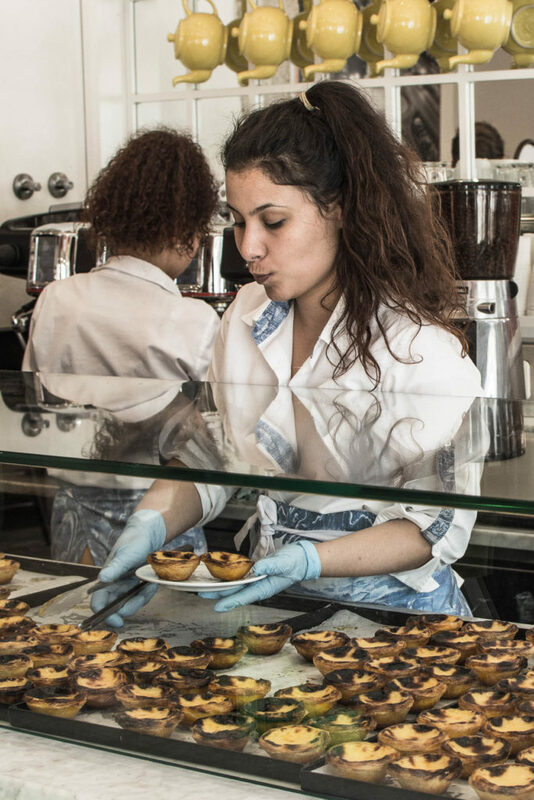 The last stop was a dessert at a place where they have the best pastéis de nata in Lisbon. This typical Portuguese dessert is basically a custard cream tart served warm with cinnamon and sugar. They were invented in 18th century by the Catholic monks from the Jerónimos Monastery in Belém. They used plenty of egg whites for starching clothes and tonnes of yolks were thrown away as they did not know what to do with it. 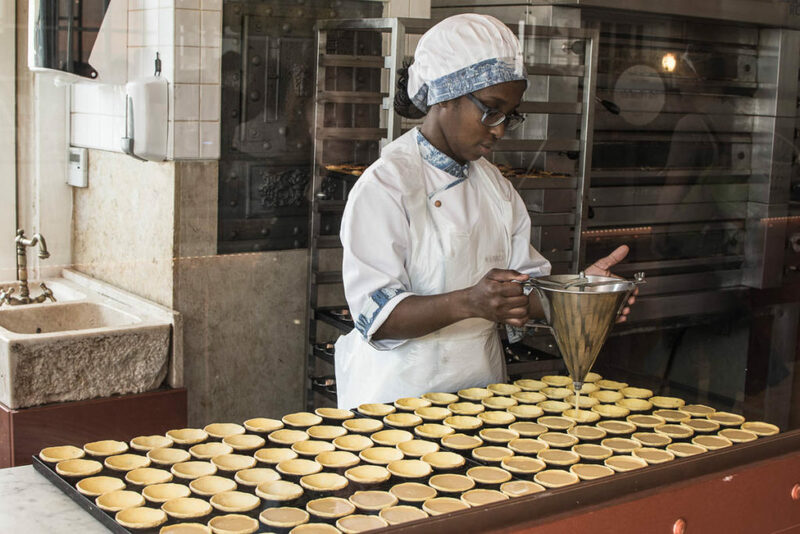 After the Portuguese sailors brought the sugar from Brasil, within the Portuguese Discoveries, the monks started to mix egg yolks with sugar and produce these custard tarts that became famous worldwide. Apparently, it is very difficult to make them – there are special schools for that – and every year, there is a competition in marking the best ones in the whole Portugal. The one I had here was amazing – the pastry was crispy and light and so the cream which was also full of flavor. After 3.5 hours of walking, talking about Portuguese food and culture, Lisbon and its places, the tour was finished here. My belly was full as one can get to eat a lot during this food tour! I really enjoyed everything about this food tour – the food was delicious and Carmen packed me with information and useful tips that I will keep for my next time in Lisbon, hopefully sometime soon! 🙂 I also can’t wait to take a food tour in other cities with Secret Food Tours! If you would be interested in more information about this tour or try it in any other city, check out their website. Disclaimer: I reached out to Secret Food Tours on my own initiative considering that my honest review of this tour might be a good fit for my audience. They agreed in exchange for a discount price. All opinions expressed in this review are my own. I would like to thank Secret Food Tour Lisbon for hosting me and also for their flexibility related to my dietary restrictions. Also many thanks to our guide Carmen for this amazing experience and tips! I so want to go to Portugal after all it’s only a drive from home in Spain, but now you’ve really sold it. The food ( and your photos) are amazing. 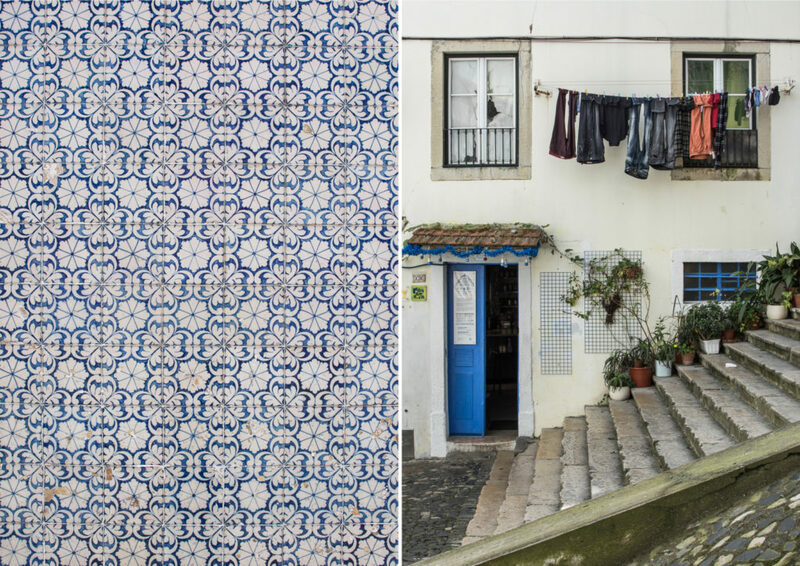 Lisbon looks so romantic – it’s now nearer the top of my list! How great to find a food tour exactly based on your specific requirements. 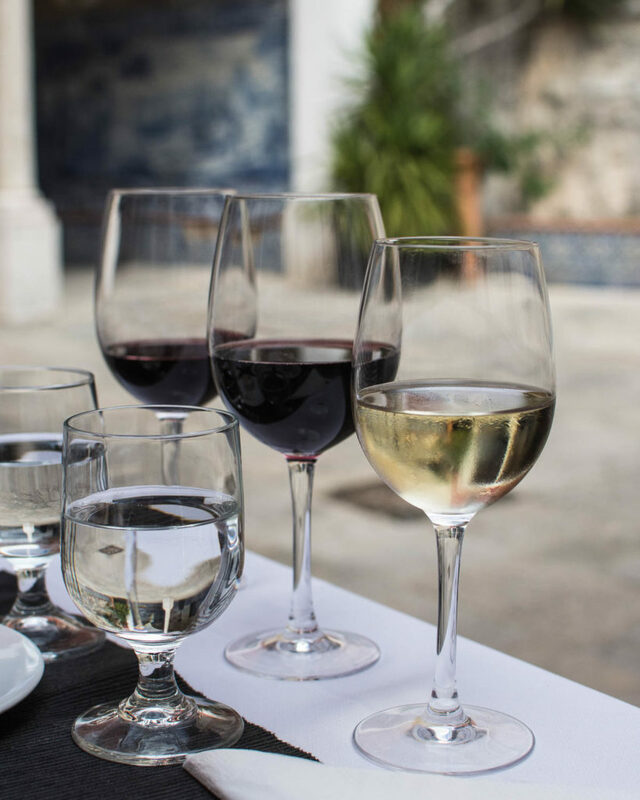 I have been to Porto in Portugal and undertaken a food tour, and loved it. I love Portugal in general and now will have to visit Lisbon too! Go go go! 🙂 you will love Lisbon. Porto is still on my list and now after Lisbon I want to visit it soon! My mouth is watering! This looks so amazing! One more thing to add to my list in Portugal. This is AWESOME! 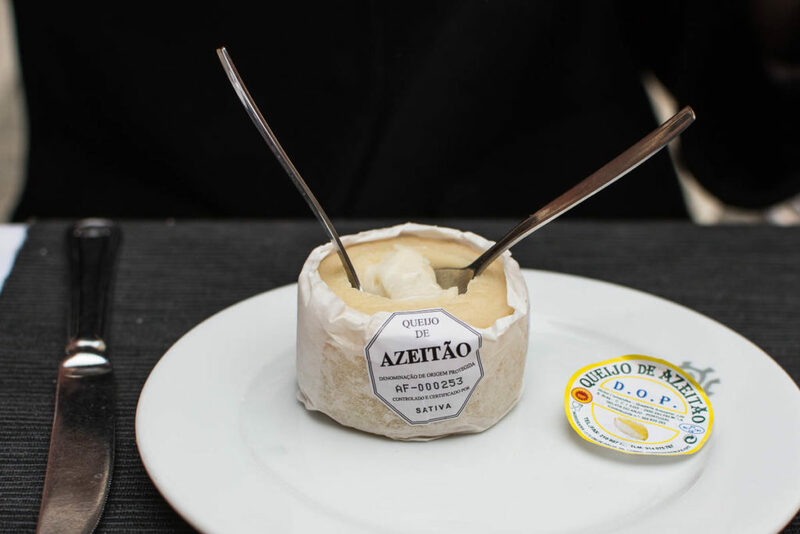 Amazing post and it makes me want to go be a foodie in Lisbon asap! Great job. Wow it seems like an amazing experience! I love how having bread with cheese is part of the Portugese food experience. I definitely like to try Secret Food Tours when I go travelling. You should! They do these tours in other cities such as Paris or Barcelona, just check out their website. I had a great time with them in Lisbon and I am sure it will be awesome elsewhere! this post def made me very hungry! me and my husband are big fans of food tours when we visit a city – it’s a great way to get introduced into the local cuisine before exploring on your own! I agree, it was my first such experience and I found it a great way to discover the destination indeed before your own tour! 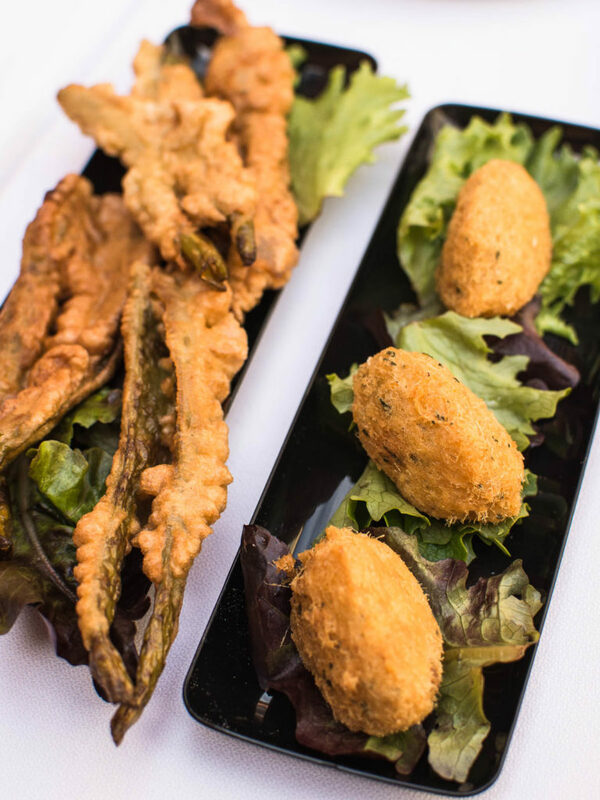 The ginjinha sounds delicious and as for the cheese and sardines, they look yumy. Although it’s the Portugese tarts that I love the best! 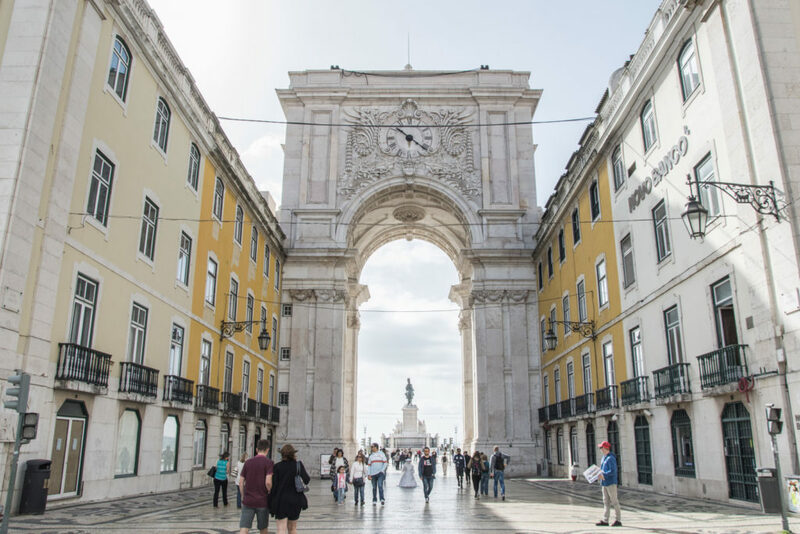 Lisbon is a great city – I like the vibe and the food is splendid!